Back in the summer of 2008, The Chicken Rice Company introduced for the first time in Singapore, the ubiquitous chicken rice dish loved by locals and tourists alike, but made only with premium antibiotics-free Sakura chicken to go with it’s flavoursome rice and delectable homemade sauces. The Chicken Rice Company, a homegrown franchise established, has conceptualised a menu that offers customers a healthy rendition of the local favourite with no compromise on the flavour and enjoyment factors. "Unlike most common versions, our chicken rice does not leave an uncomfortable oily aftertaste and customers appreciate the effort that goes into creating a light meal that remains very tasty," elaborates a spokesperson. 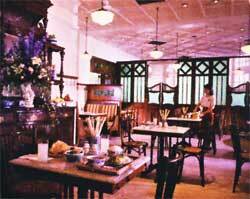 The Chicken Rice Company comprises two main components: a franchise chain of casual hawker stalls like the ones that opened at Newton Circus and Lau Pa Sat; as well as a fully licensed chicken rice catering arm that organises chicken rice parties – a first in Singapore – bringing the authentic experience right to your doorstep. 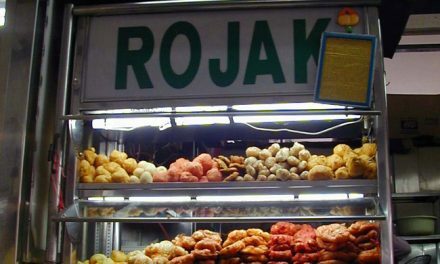 Known for its succulent and flavourful meat with minimal fat, this special breed of chicken – originally from Japan – is bred in Malaysia using advanced Japanese farming methods whereby the chickens are reared in climate-controlled environments and feed on an all-natural mixture of ingredients: corn, soybean and Japanese lacto. Better quality meat is produced because no growth hormones or antibiotics are used – as a result the chickens are bred to a maximum weight of 1.8 kg to ensure the flesh remains supple. Constant moisture with Japanese lacto is introduced into the air to ensure cool surroundings for the poultry and the temperature is kept constant, ensuring that the chickens are bred in a stress-free environment. The feed is similar in characteristics to natural bacteria and provides a better diet for the poultry. The chicken is simply boiled in a vegetable stock and served de-boned for easy consumption. 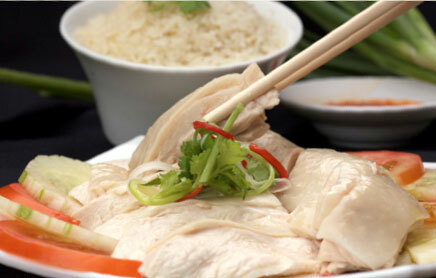 The Chicken Rice Company is the only chicken rice operator in Singapore to use only Sakura chicken in all their dishes. The stock that is derived from boiling the chicken is reduced to a concentrated liquid full of intense flavour. This liquid is then used in the process of cooking the rice, without the need to add excessive chicken fats. In addition, the rice grains are firm to the bite and do not leave an oily residue in the mouth. This is because the Sakura is not as fatty as the regular chicken, and hence the stock produced is less oily. Carefully concocted and subjected to stringent recipe tests, these two sauces are the perfect complements to the chicken. The chilli sauce is a balanced blend of quality chilli padi from Vietnam, red chillies, and calamansi juice, while the spring onion-ginger sauce is an invigorating mix of spring onion, ginger, garlic and shallots. Special effort is made to source for top grade ingredients to ensure only the best flavours are derived from them. Apart from a takeaway delivery service, The Chicken Rice Company also operates a fully licensed catering arm, which can handle large-scale orders with ease – the latter a service that is a first in Singapore for chicken rice. As The Chicken Rice Company is supported by an efficient central kitchen with full catering capabilities, customers who order in or dine at the stalls can be assured of consistently succulent and flavoursome chicken rice. Both takeaway delivery and catering services are ideal for office lunches, boardroom meetings, celebrations and parties with a local flavour. 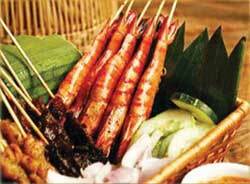 Customers can call delivery and catering specialist Anthony at +65 9686 4802. For takeaway deliveries, orders will be delivered within one hour; for catering and parties, two days advance notice is required. All areas of Singapore can be delivered to.